In the late 1920s, Steve Bloomer of England and Derby County described the Everton team, which at the time feature the great Dixie Dean, in glowing terms. It was a quote that befitted Everton perfectly and from that moment forwards the School of Science was born. Many Everton teams throughout the years have truly lived up to that billing, with the successful sides of the 30’s, 60’s and 80’s winning League titles playing football the ‘Everton way’. However it has not always been the case. After a period of decline, the School of Science appeared to have permanently closed down following the appointment of Joe Royle in 1994. This statement is harsh on Joe, but the facts are, with Everton fighting at the wrong end of the Premier League table, Royle had to find a different way for Everton to play. The Blues became more direct, using the pace on the wings of Limpar and later Kanchelskis as well as the aerial threat of Ferguson and Rideout. Everton became known as ‘the dogs of war’ with a midfield made up of tough tackling ball winners. For a time it worked brilliantly. The FA Cup was won in the spring of 1995 and the following season the Blues were once again competing at the top end of the Premier League table. Unfortunately the Royle reign ended all too soon and from that point forward the club endured a difficult time, fighting to avoid relegation until the arrival of David Moyes in 2001. Moyes transformed Everton and the Blues were never genuinely threatened with relegation during his eleven years at the club. Everton often employed a pragmatic approach under Moyes, looking for tactical ways to win each fixture. This approach often paid dividends and the team did enjoy relative success. But with this approach, the style of the team often suffered and despite improvements brought on by the arrivals of Arteta and Pienaar, the play was often dour. 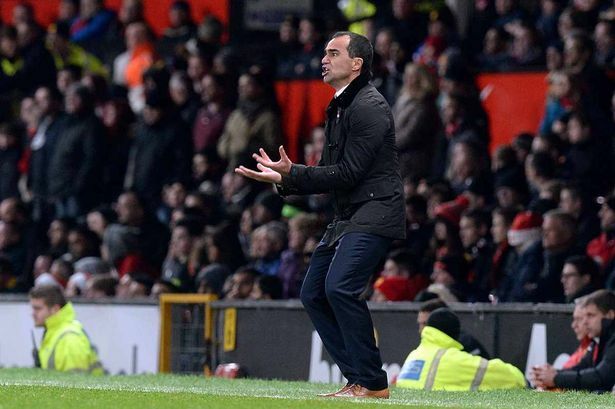 Since the appointment of Roberto Martinez, Everton have sought a return to playing entertaining football. Pass and move, so often the watch words from across the park are now evident at Goodison Park. Every player is becoming more and more comfortable with the ball at their feet and quicker than anyone expected; the Blues are proving exciting to watch and away allocations are selling out quickly as Evertonians clamour to watch their side up and down the country. This Everton team is blessed with incredible talent. In Seamus Coleman and Leighton Baines, Everton could claim to have the best right and left back in the Premier League. Coleman in particular has been in the form of his life, producing thrilling attacking performances, scoring and creating goals and yet maintaining a solid defensive presence. John Stones, the youngest member of this Everton team, plays in a manner which defies his youth. Calm and composed, Stones is the perfect centre back for a team looking to play in this way. The former Barnsley man is comfortable in possession and has a level of arrogance on the pitch that exudes confidence. In midfield Everton have two players that could form the foundation of this Everton team for the next 10 years. James McCarthy has arrived from Wigan Athletic and raised his game to the high standards expected by the Evertonians. McCarthy was always a player of huge potential, but he has now added consistency to his game and it is no exaggeration to state that he could have been man of the match in at least 50% of Everton matches this season. The diamond in the team is Ross Barkley. Criminally overlooked by David Moyes, the 20-year-old Evertonian takes the Blues to another level. He has the potential to be the best player England have every produced. Rarely is a player blessed with so many natural talents. Big, strong and powerful, quick, two footed, great balance, speed and agility. These are just a few of his many qualities. Barkley is able to ghost past players and has a blistering shot, which almost uniquely, he is able to hit off either foot. Everton are a team full of great players and they have transformed their style far quicker than anyone expect, even Martinez himself admitted in his recent interview with various independent Everton sites how surprised he was at the speed in which the players have adapted. A banner at the Manchester United match in early December proudly proclaimed ‘The School of Science is back’ and after defeating the Champions in their own back yard, Everton travelled to the Emirates 4 days later and outplayed and out classed Arsenal, a side recognised by most as the best passing side in the country. Not only did this prove that this Everton side could take on the best, but for a new generation, Everton are once again serving up football of the highest scientific order. Next Post Catterick’s 2nd biggest mistake!! !